Figo is an Italian-inspired restaurant but it doesn't entirely rest upon regional representation. While pizzas and pastas are plentiful, the menu embraces ingredient-driven, seasonal cuisine. 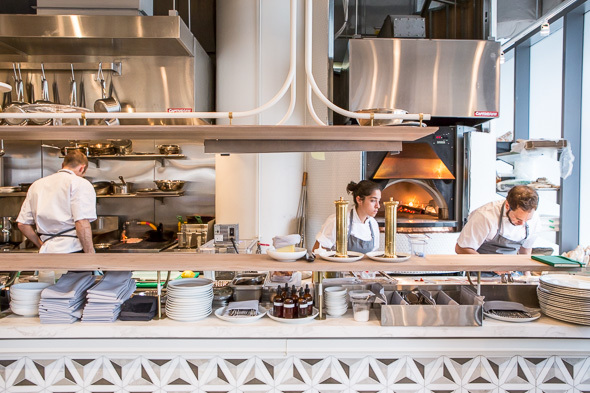 The restaurant from Hanif Harji and Charles Khabouth joins a diverse empire of Toronto establishments that includes Weslodge, Patria, Byblos and Nao. 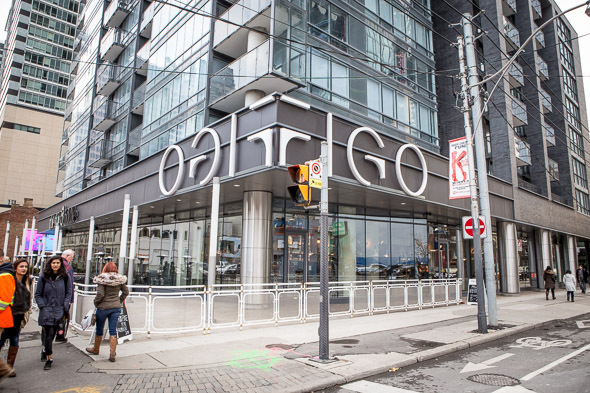 Figo might be the most feminine, though I'm told the objective is to offer a premium dining experience that doesn't feel too precious. The room, designed by Studio Munge is swathed in light, muted pastels. The decor is a composite of eclectic and sometimes contrasting elements. 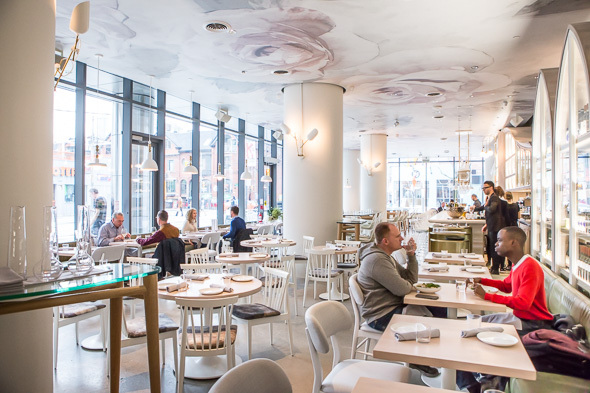 The floors, for example, are polished concrete, while the ceiling is patterned with blooms. The bar cascades with nouveau lines but the wine cabinets point upward into gothic arches, and the open kitchen and wood fire oven are framed by a subway-tiled archway. At the bar they're making a lot of pink drinks. The wine list specializes in light reds and full bodied whites, while the cocktail list offers shareable beverages like the Punch Americano, a potent four-person cocktail served in a crystal decanter ($60). 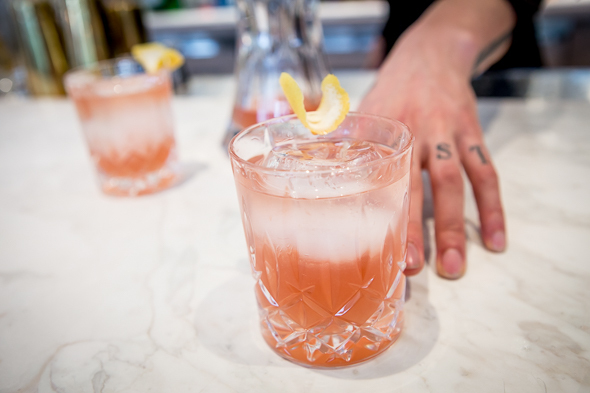 It's very much like a vermouth spritzer, an easy to drink blend of Cocci Rosa, Cocci Americano, premium rum and tangy white cranberry juice. This isn't the place for a three-martini lunch, but imbibing at brunch, lunch, or dinner is encouraged. At lunch hour there's the option to partake in a $19.95 prix fixe offering a choice of soup or salad to start, pasta or pizza main, and a dessert. The value for those on-the-go might be there, though it bypasses plenty of treasures from executive chef Anna Chen that are found on the a la carte menu. 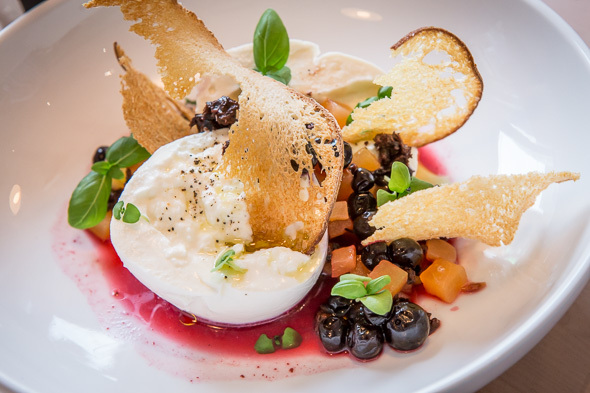 The house-made ricotta ($9) with truffle honey is a dish I wouldn't want to miss. 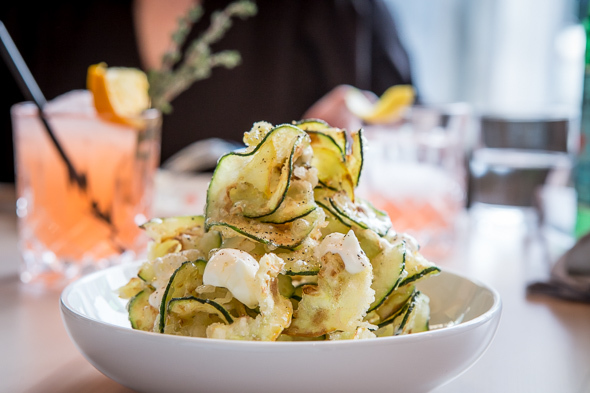 Nor are the zucchini fritti ($11), an addictive plate of deep fried zucchini ribbons served with lemon creme fraiche. The menu lists burrata ($19) as a salad, even though the cheese is clearly the star on the plate. In fact, vegetables are entirely absent as compressed cantaloupe, pickled huckleberries, and Moroccan olives complete the dish. 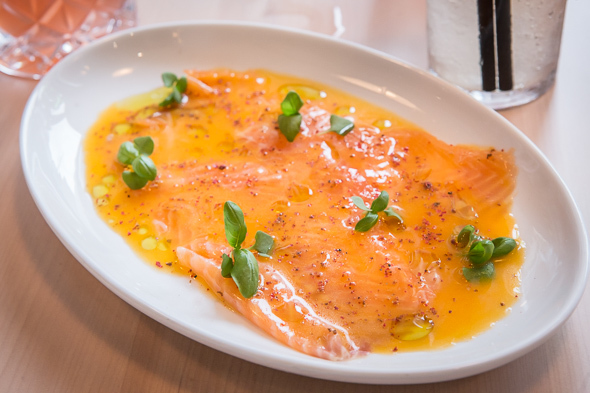 Rainbow trout crudo ($14) is dressed with sea buckthorn vinaigrette and finished with pink peppercorns. It's a dish that relies on high quality ingredients served with little manipulation - a common theme on this menu. The pizzas are wood fired but the crust is sturdier than a classic Neapolitan pie and the ingredients aren't nearly as sparse. 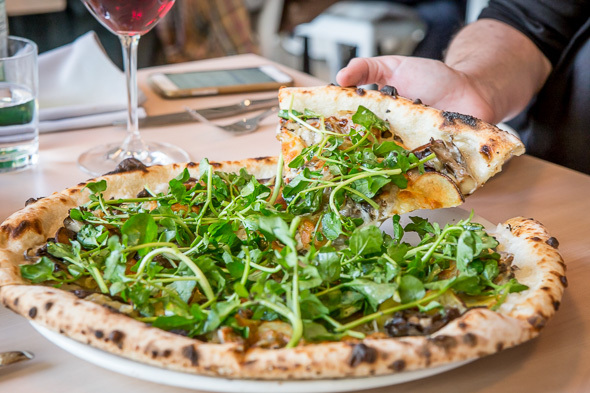 The mushroom pizza ($19), for instance, is thoroughly blanketed with toppings: a base of potatoes, caramelized onions and cacciocavalo is layered with cremini and maitake mushrooms, then watercress and truffle oil. Sandwiches, under the heading Puccia, make use of the same pizza dough. There are four of these on offer at lunch including grilled eggplant ($14), chicken ($16), soppressata ($16), and meatballs ($16) built on fresh, crusty half moons of bread. I tried the chicken dressed up with bacon, preserved tomato, slaw and mustard aioli. While the flavours hardly seem Italian, it's delicious, maybe even better than the pizza. 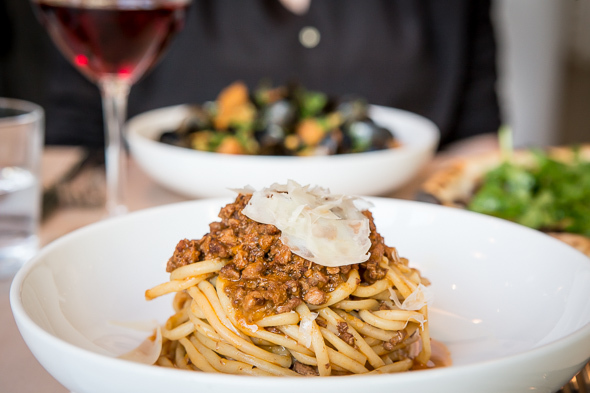 Only three pastas are offered at lunch, but the freshly extruded bucatini with hearty wild boar ragu ($19) is among them. 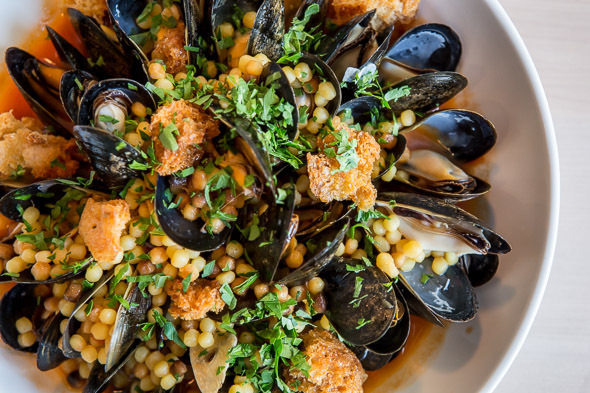 At dinner hour, you'll find an extended list that includes fregula ($18), a dish that more closely resembles steamed mussels, but also offers tiny beads of pasta to help soak up the saffron tomato broth. 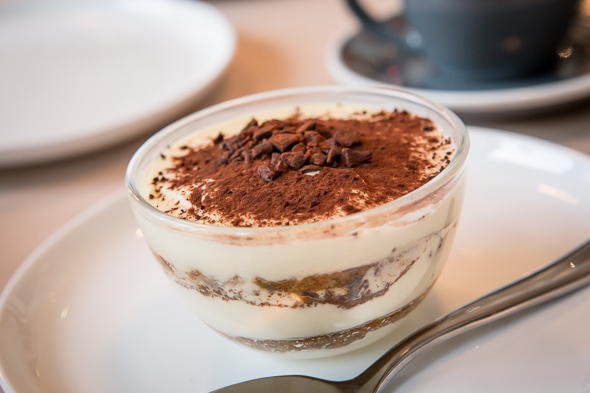 For dessert, Tiramisu ($8) is rich but not too sweet - a worthwhile closer if you have the capacity.